Fig. 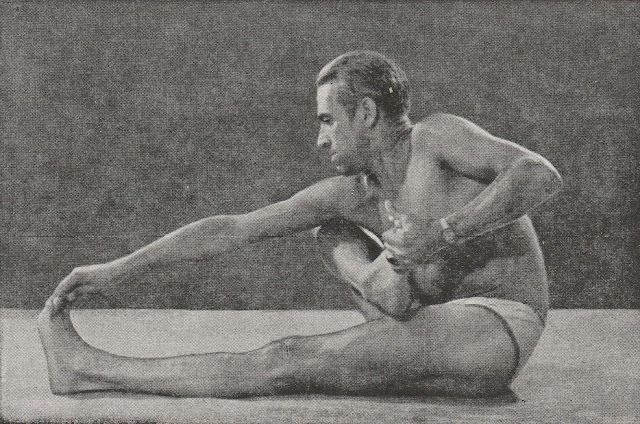 1: Boris Sachrow performs "Akarshana Dhanuarasana." Svāmī Śivānanda Sarasvatī (b. 1887 - d. 1963) mentioned his “correspondence” student, the Ukranian Boris Sacharow (b. 1899 - d. 1959), in his book Practical Lessons in Yoga, which was first published in 1938.1 In 1937, Sacharow had opened Germany’s first school of physical yoga in Berlin.2 He probably never met the Svāmī in-person, since the famous guru most certainly never travelled to Europe. This is an interesting piece of yoga history in today’s times of growing appreciation for direct guru-śiṣya (teacher-student) relationships supporting ‘spiritual growth’.3 Boris Sacharow reports that, from 1937 to 1945, despite the Second World War,4 he was supervising yoga students from approximately fifty German cities, either in person or by mail. Based on these early teachings, Sacharow published seven sequential booklets (twelve issues) between 1950 and 1960 with the title Indian physical training (Hatha-Yoga). Practical method of body culture in 12 issues according to Indian standard.5 These brochure-like publications form the basis of this study as they bear witness to the earliest practice of Haṭhayoga in Germany. (Sacharow 1950. Vol I, Issue I). 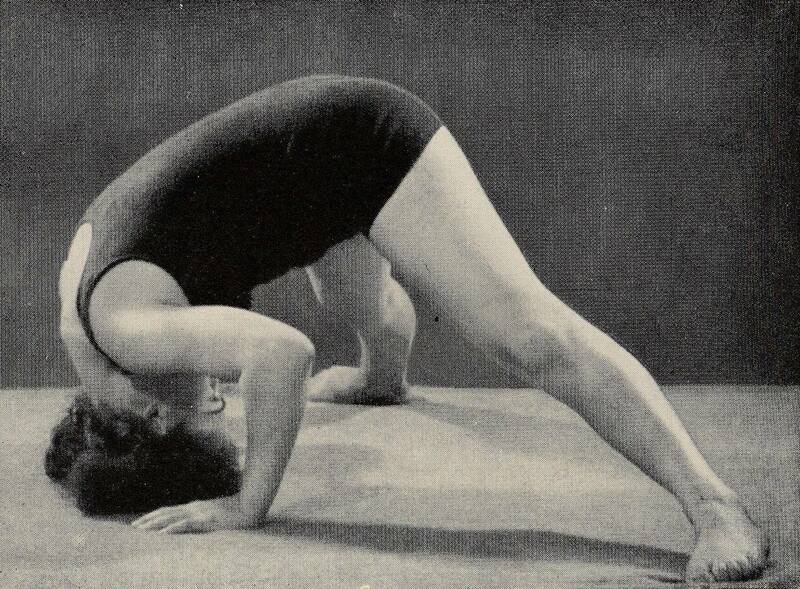 In the early 20th century Germany, ‘Yoga’ had already become a common term. Owing to the well-known translations of Patañjali’s Yogasūtra of the time, it mainly designated Rājayoga and not Haṭhayoga. In 1924, the first German yoga school with the name ‘Deutsche Yoga-Hochschule’ (German Yoga University) opened its doors under the chairmanship of the musicologist F. Weber-Robine. Its teachings were mainly concerned with “Rājayoga in scientific and practical form” (Wedemeyer-Kolwe 2004, 143). It is most likely that the classes offered sessions similar to those of the popular New Thought movement of the time, which frequently referred to Rājayoga as breathing techniques, will-strengthening, autosuggestion and positive thinking, and did not include elaborate physical practices. This suggests that, at that time, there was not yet a system called (Haṭha-) yoga which linked complex physical postures to spirituality.6 Thus, from its earliest reception in Germany, yoga was a cultural hybrid rather than a fixed concept. It was established without direct contact to any Indian yoga master and was, moreover, based on literature. Fig. 3: Boris Sacharow preforms "Uddiyana Bandha"
(Sacharow 1950. Vol II, Issue II: 43). In keeping with Śivānanda's doctrine, Sacharow believed that the āsana-s, although occupying the centre-stage of his teachings, are just a part of a much larger step-by-step path, which is based on the eightfold division (aṣṭāṅga) of the Yogasūtra. Among them, Sacharow mainly taught prāṇāyāma and dhāraṇa (concentration). The yama-s (ethical observances) and dhyāna (meditation) are discussed in later volumes of his publications, while he merely mentions samādhi - “the highest immersion” (Sacharow 1950. Vol XII, Issue XII: 48). This combination of intensive health-and-effciency-oriented bodywork with elements of Haṭhayoga, medical rationalization, concentration exercises, and the goal of Vedantic self-knowledge closely reflects the method and spiritual path of Svāmī Śivānanda. (Sacharow 1953. Vol III, Issue III: 24). For maintaining a high standard of health, I practised Asanas, Pranayamas, Mudras and Bandhas. I used to go out for long brisk walks in the evenings. I combined physical exercises such as Dand and Bhaitak11 also (Śivānanda 1995 (1958), vi). As an adult I was fond of gymnastics and vigorous exercises (Śivānanda 1995 (1958), vi). It seems that, while being trained in many physical activities in his youth, Śivānanda, unlike T. Kṛṣṇamācārya, did not undertake the practice of yogāsana-s in his childhood. It is thus to be presumed, that he only came into contact with the practice of āsana later, maybe during his travels in India before he settled in Rishikesh. Svāmī Śivānanda taught Sacharow a combination of two systems which the German literary audience had previously – under the influence of Svāmī Vivekānanda – considered to be different: ‘physical’ and ‘mental’ yoga. 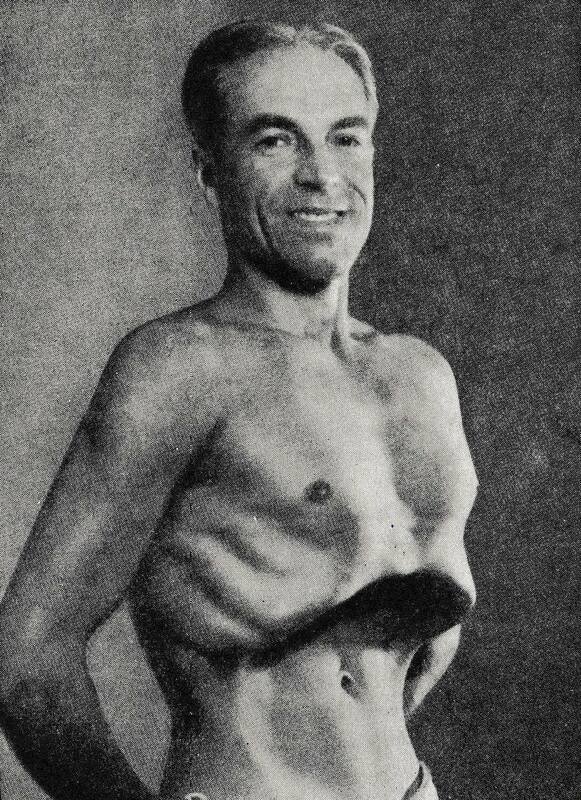 By combining both, Sacharow’s Haṭhayoga was a holistic life concept, which included hygienics, dietetics (vegetarianism, no alcohol, no cigarettes), ethics in the form of Patañjali’s yama-s, like non-violence (ahiṃsā), and techniques to train certain mental attitudes or abilities. It was his pioneering work that led to the formulation of a modern style of yoga in Germany. Indeed, Sacharow’s Haṭhayoga was based on a worldview and lifestyle which has been carried forward by most styles of modern yoga practised in Germany today. Baier, Karl. 1998. Yoga auf dem Weg nach Westen: Beiträge zur Rezeptionsgeschichte. Würzburg: Königshausen und Neumann. Sacharow, Boris. 1950-1960. 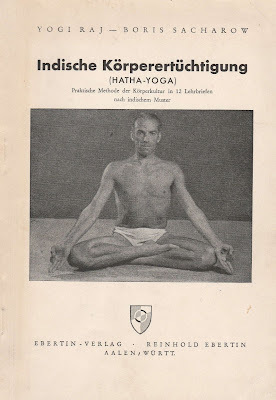 Indische Körperertüchtigung (Hatha-Yoga): Praktische Methode der Körperkultur in 12 Lehrbriefen nach indischem Muster. Volume 1, 3 and 4. Aalen/Württ: Ebertin. Volume 2, 5, 6 and 7. Büdingen-Gettenbach: Lebensweiser-Verlag. Śivānanda, Svāmī. 1995 (First published 1958). Autobiography of Swami Sivananda. Tehri-Garhwal: The Divine Life Society. Śivānanda, Svāmī. 1938. Practical Lessons in Yoga. Motilal Banarsi Dass: Lahore. Śivānanda, Svāmī. 2004 (First published 1931). Yoga Asanas. Tehri-Garhwal: The Divine Life Society. Tietke, Mathias. 2014. Yoga im Nationalsozialismus: Konzepte, Kontraste, Konsequenzen. Kiel: Ludwig. Wedemeyer-Kolwe, Bernd. 2004. Der neue Mensch: Körperkultur im Kaiserreich und in der Weimarer Republik. Würzburg: Königshausen & Neumann. 1 See Śivānanda 1938, 116. 2 There is evidence that Sacharow only came to Germany in 1926 (Tietke 2011, 83). In this case, the statement by his successor Sigmund Feuerabendt that Sacharow founded his school in 1921 is unlikely. Also, the ‘school’ was a very small establishment, as it was situated at Sacharow’s home. 3 This is, for example, the opinion of Paramaguru Sharat Jois. Retrieved from: http://www.sonima.com/yoga/yoga- guru/. Accessed on: 25 February, 2018. 4 Sacharow did not seem to have been actively involved in the Nazi regime. It is still astonishing that he was allowed to teach his Yoga system during that period, as he himself notes that all things “mystical,” “occult” and “foreign” were banned by the Nazis (Sacharow 1950, Vol I: 7). He states: “Somehow I was able to convince the authorities of the scientific character of these doctrines.” Translated by the author. The German original is: “Irgendwie konnte ich die Autoritäten vom wissenschaftlichen Charakter dieser Doktrinen überzeugen” (Tietke 2011, 89). In his foreword to the first of his booklets, Sacharow emphasizes that he had supporters at the time and that, due to the circumstances, he had to limit his explanations about the learned method to a minimum of what was permissible (Sacharow 1950, Vol I: 8). 5 Translated by the author. The original title is Indische Körperertüchtigung (Hatha-Yoga). Praktische Methode der Körperkultur in 12 Lehrbriefen nach indischem Muster. 6 On the one hand, the well-known Theosophist Annie Besant recommended simple gymnastics in order to keep fit for meditation and, on the other hand, yoga-like breathing techniques as well as yogic postures like the lotus seat were used in bodybuilding (Wedemeyer-Kolwe 2004, 145f). 7 This is the subtitle of Sacharow’s booklets. 8 Śivānanda notes: “Though the body is Jada (insentient) and useless, yet it is an important instrument for Self-realisation. The instrument must be kept clean, strong and healthy” (Śivānanda 2004 (1931), xv). 9 Śivānanda reports in his autobiography that he adjusted the practice of the students according to their needs, even if in this case he writes about a spiritual, not a physical practice: “I closely observed their faces to see if they liked the work and then carefully selected matter suited to their taste and temperament and entrusted them with the work. Sometimes I had to do the whole work. I love the students. Unasked, I attended to their needs” (Śivānanda 1995 (1958), 18). 10 Sacharow mentions that he deliberately left out some parts of Haṭhayoga by concentrating on the āsana-s and simple forms of prāṇāyāma while replacing the omissions by exercises of other types of yoga (Sacharow 1950, Vol I: 8), which he doesn’t specify. 11 “Dand and Bhaitak” are push-ups and squats, stemming from the Indian martial arts and wrestling traditions. 12 For a description of this early, pejorative reception of “Yogins”, see Baier (Baier 1998, 79- 85). Laura von Ostrowski is a PhD student at Ludwig-Maximilians-Universität (LMU) München, who wrote her Master thesis about the early reception of the Yogasūtra in Germany. In her current project she is primarily interested in the history of the reception of yoga texts in the modern age, as well as in the various forms of knowledge that emerge from a "lived" or "embodied philosophy". She has been a yoga teacher for eleven years (website coming soon) and pursues an active yoga practice.